Home Trees and shrubs New South Wales and Queensland African Oil Palm Australian Fan Palm Bauhinia Coast Banksia Black Bean Curtain Fig Flamboyant Flame Of The Forrest Jacaranda Queensland Bottle Tree Queensland Kauri Rainforest tree Rattan Palm Red Cedar Saw Banksia Unknown tree This tree growns at Lake Barrine and I photographed these fruits in early November. The fruits (or flowers) growing from the trunk is a bit, but not terribly unusual. Some rainforest trees do so, probably to protect the precious seeds from the reach of canopy-dwelling birds and mammals. 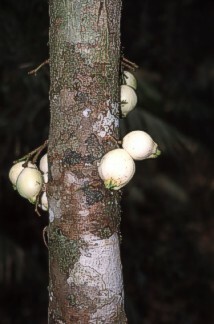 Cacoa is a common example of these so-called cauliflor trees. But which one is that?